So here we are – the start of the Bank Holidays for 2015, and it’s a nice early Easter. The recent sad demise and subsequent emergency replacement of my iron meant that my holiday started with a full ironing basket, but once that was out of the way I headed for the kitchen. Dessert for Easter Sunday will be a ‘tidy’ pavlova style dish – Hazelnut & Baileys Meringue Cake. I baked the two meringues today (the mixture tasted like nougat which is no bad thing as far as I am concerned) and on Sunday morning I will fill them with the Bailey’s cream and raspberries. As is the way with meringue, the next question that arose was what to do with the five remaining egg yolks… A quick telephone consultation with Mother ensued, and I now have a bowl of lemon curd in the fridge, swiftly prepared in the microwave. 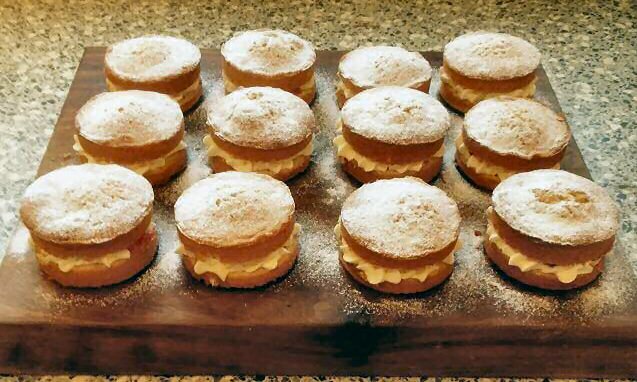 The final bake of the day was a batch of 12 mini Victoria Sponge cakes, made in my loose bottomed mini sandwich tin (sadly they are about to discontinue this, but there is still time to get one for half price if you’re quick!). The cakes were filled with buttercream and the above mentioned lemon curd, and dusted with icing sugar – so cute! Tomorrow the plan is to produce two dozen Easter cupcakes, also for Sunday. After all that sweet stuff, something savoury is required, so this blog is being typed in front of the cheese-fest that is the Eurovision Greatest Hits on BBC1. Some of the previous winners are showing their age, although Lordi don’t look a day older than they did when they won, and some of them are still just plain wrong, but Graham Norton is co-hosting with is usual irreverence, and has just introduced a Eurovision legend. No, no, not Abba – Johnny Logan of course!